1. Larghetto Aria: "Dies Bildniss ist bezaubernd schön." 2. Andante Quintet: "Der Arme kann von Strafe sagen"
3. Adagio Aria: "O Isis und Osiris, schenket der Weisheit Geist." 4. Andante Duet: "Bewahret euch vor Weibertcken"
5. Larghetto Duet: "In diesen heilg'gen Hallen." 6. Adagio Marcia: "O Isis und Osiris, welche Wonne!" Mozart's opera "The Magic Fute" was first performed in September 1791, a few months before the composer"s death . It was written for Schikaneder's theatrical troupe with whom Mozart had written some music for previous productions of that company and was performed in the Freihaus-Theater auf der Wieden where the troupe was the resident company. While The Marriage of Figaro is opera buffa, The Magic Flute borders on "vaudeville" with moments of comedy and slapstick together with intense drama. For the arranger it is a rich source of material with memorable tunes throughout and many arrangements have been made of the opera from such as Triebensee and Wenzel Sedlak. It was a potentially lucrative business to arrange material from popular operas, and required no little skill to do successfully. Mozart recognised this source of income when he wrote to his father in 1782: I have no little work in front of me. By Sunday week my opera [probably "Die Entfhrung aus dem Serail"] must be orchestrated for a band, or someone will step in in front of me and take the profit. ... You cannot imagine what hard work it is to orchestrate such a thing to make it fit for wind-instruments without sacrificing the whole effect. Well, I must just spend the night over it. 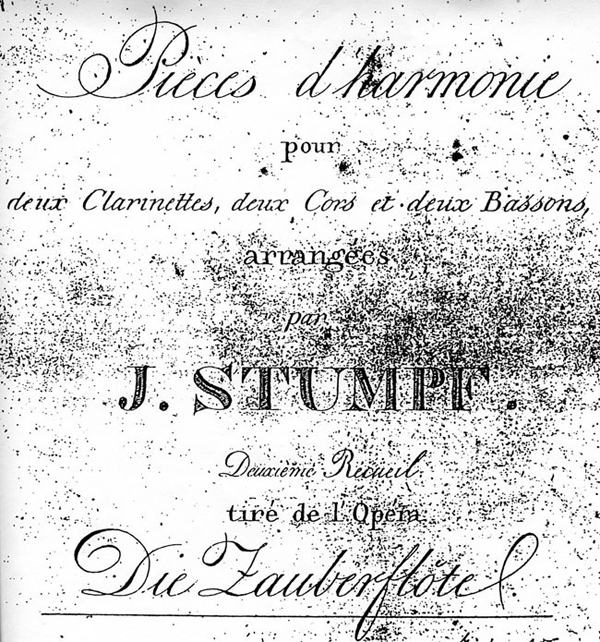 This arrangement is by Johann Christian Stumpf (c.1740 – c.1801) who was a German composer and bassoonist. Very little is known about him but he seems to have spent most of his time in Frankfurt-am-Main employed as a professional bassoonist. 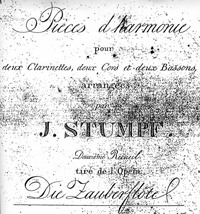 Arrangements of operatic choruses and arias were very popular at the time and Stumpf was happy to produce more than twenty of them. The majority were scored for wind sextet as this one is, and he used this combination in his only original Harmonie work, the Harmonie in E flat for 2 clarinets, 2 bassoons and 2 horns. According to the title page this is the second collection of arias and choruses from The Magic Flute that Stumpf arranged.